“Lift weights three times a week, Monday, Wednesday and Friday.” No matter how old you are – from high school to nursing home – no matter how fit or or out of shape you are – from athlete to pre diabetic – you are always advised to lift weights three times a week for the rest of your life. The problem is, this advice ignores something. Reality. To build new muscle you have to force it to operate at or near its peak output. That’s why gyms are filled with heavy things. They provide an artificial load to tax a muscle. When the muscle is taxed to its limits a signal is sent to the Central Nervous System to build new muscle so the stress is not so extreme next time. You leave the gym. You rest for a period of time and after you recover your body builds some new muscle. Probably while you are sleeping. Hey, why not go to the gym three times a day so you build muscle faster? Or why not just stay in the gym and lift until the scale and body fat measurements say you’ve added a couple pounds of muscle today? The answer, of course, is that it takes time for the muscle to grow. Like hair. Like fingernails. It takes some time. OK, how much time? How can I know my trapezius muscles have grown? Well, if they grew they would be stronger. They could lift more weight. Virtually nobody in your gym measures his strength. So they can train Monday, Wednesday and Friday for month and (if they don’t get sick and have to quit) they will never realize they are making zero progress and probably moving backwards in strength. Right now we are working with several dozen people on a Power Factor Study who perform the same six exercises for sixty days. In 100% of cases the trainees can NOT continue on a fixed schedule of days off and still make progress. I don’t mean 99% of cases – I mean exactly 100% of them. 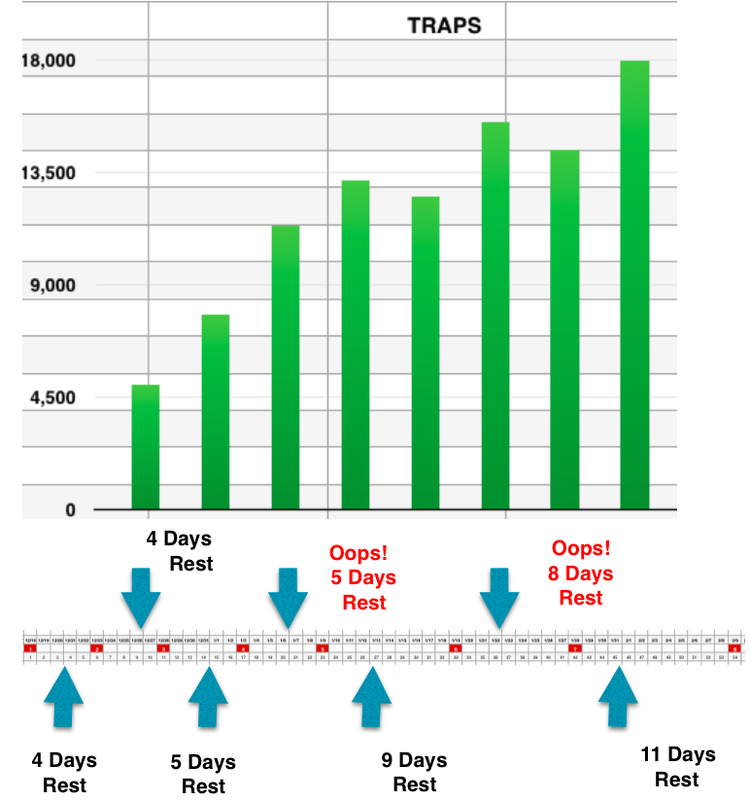 The image below shows you the real data from a typical trainee’s barbell shrug exercise for his traps. When he started I scheduled four days off after his first and second workouts. Then I gave him five days off. It worked. It was enough time to fully recover and for new muscle to grow. But on his fifth workout it was not enough time off and he saw a decline in his trapezius strength. His fifth workout showed a 5.0% decline in the total weight he could lift in 30 seconds. He dropped from 13,160 lbs to 12,500. Did his trapezius muscles whither away in five days? Did atrophy set in? Muscle wasting? Of course not. He just wasn’t fully recovered – and therefore weaker, plus no new muscle had grown so he was not any stronger. So he took nine days off. And guess what? He set a new record because he had new muscle. Then he only took eight days off between workouts. Oops. Not enough. He went backwards again. So he took eleven days of rest. Some new muscle grew and – no surprise – that new muscle allowed him to lift even more weight, 17,920 lbs in 30 seconds. His eight workouts took 54 days. If this trainee ignored reality and trained three days a week for that time he would have performed 23 workouts instead of 8 workouts. Does anybody seriously believe that performing triple the number of workouts would have made him triple as strong and build triple the muscle? After his errant fifth workout he’s have kept digging a deeper and deeper hole for himself, pounding away every Monday, Wednesday and Friday until he got sick or mislabeled himself a ‘hardgainer’ who thinks he can’t build any new muscle. Then maybe he’d resort to the needle for some help. Or may just waste $400/mo on nutritional supplements. Do You Want To Build Muscle Or Just Lift Weights? The reality is that no two workouts should ever – ever! – be the same. When you walk into the gym you are supposed to be a different man than when you left. You are supposed to have new muscle and new strength. Whatever you lifted to trigger muscle growth last time is not enough this time because you are bigger and stronger. The people in your gym are blind to this reality because THEY DON’T MEASURE ANYTHING. They don’t know their output per muscle group. They don’t know their output per exercise. They don’t know the total output of their workout. They don’t know if today’s biceps workout was 12% more intense than the last one or 18% lower. They don’t measure reality so they think they can ignore reality. If you train with you brain you will make your life a lot simpler. You won’t waste workouts. You won’t beat up your muscles, tendons, joints and ligaments for zero gain. You won’t deplete your energy for nothing. By simply measuring the intensity of your lifts you will have mathematical proof of the effectiveness of your individual exercises and your overall workouts. And that always – always! – means not having a fixed training schedule with fixed rest periods in perpetuity. This is a giant truth that cannot be successfully ignored. Unless you just want to lift weights and don’t care about building muscle. Or about getting weaker. Want to try rational training? 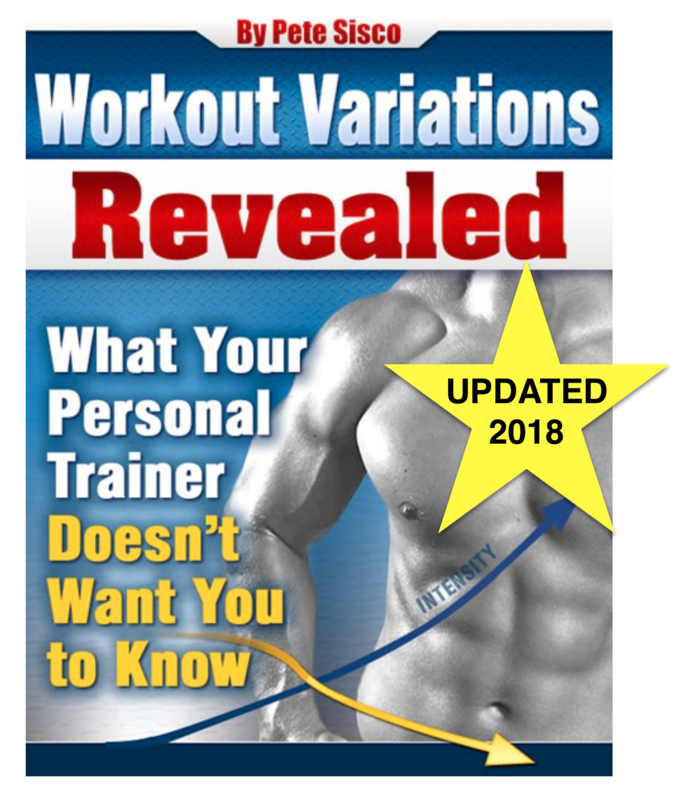 Get every workout analyzed for gains in Alpha and Beta strength and have your weight/rep goals adjusted for your personal rate of progress and your personal rate of recovery. Check this out. Previous Post Wasted Workout Or Productive Workout? Next Post Are You Wise Enough To Care About Wear And Tear? I just had 3 things I wanted to explore, and I even if your not the right man, I am sure you can steer me in the right direction. 1. Nutrition for growth – I have seen material saying that a Caloric intake is no necessary for Muscle Growth, as the body will convert the necessary matieral internally to compensate, i.e Fat. I have seen some of your articles helping people who are showing no growth signs by telling them to make sure they have enough calories. Have there been any conclusive studies conducted by yourselves on how much nutrition really counts ? 2. Pace of Muscle Growth – Reading your graphs on studied volunteers, where people are finding more success with more space in betwen workouts as they get stronger, is this cause purely due to recovery time of the CNS or is this actually to do with the pace of Muscle growth at later stages ? i.e does Muscle grow “slower” as you reach your genetic limit, or is it more a case of constant muscle growth, but much more recovery time required for CNS because of the volume of overload ? 3. More Stacking – I have more or less just started SCT, and I was thrilled with my first workout on it. 80kg’s for a pretty much everything, shoulder press, bench (within a power rack), bicep (hanging underhand pull up) for 5sec. My Triceps were much stronger from boxing, and I used 80kg’s but held for more then 20sec on a static weighted dip, so I could probably go over 100. I did a back excercise at around 40kgs for an upright row on a cable machine, but I think I could have done more. Legs I got around 120kg’s for over 20sec so I could probably double. As I said, thrilled with results, especially since I am just under 60kg’s of weight myself. But I can already see this will be hard to maintain on the current machines or weights. How have others been able to overcome this challenge ? Thank for your time Pete. 2. I don’t do tissue biopsies and blood analysis to make conclusions about exactly how and when muscle is growing. I only look at physics. How much can you lift per second today and how does that compare to your last workout? Math and physics are very exact sciences so the conclusions are clear. They are also excellent BS detectors. It’s so easy to see is I or anyone else is wrong. It shows up in the numbers. The numbers say that people do make faster progress early on. It’s easy to add that first 100% improvement, and harder to add the next 100%. And the more tonnage you lift the more time you need to recover. This is no surprise to anyone. It’s easy to take 10 strokes off my golf game because I’ve never played. It’s way harder to take 10 strokes off Tiger’s game. 3. I’m glad you’re happy with Static Contraction. Do a few more workouts and you’ll get a sense of how strong you can get. You will get too strong for some machines. I like to say some of them are made by Fisher Price. Haha! E-mail me if you have a problem on a specific exercise where you are too strong for the equipment. There are workarounds. Hey Pete. I’ve been enjoying these new articles. I like to go back and read the older ones and the comments as well. There is a lot of great information here. I really enjoy the analogies and the addressing of what to do and not do and expect a strength gain. I like your remarks about the whole purpose of gyms having heavy weights. Since strength is just one factor, it would have been a home run if you’d have done DEXA imaging and taken good photos of his growth as well. Next time!! Keep up the good work. Hi Fredrick, thanks for the comment. Some people on this informal study are taking Dexa scans but most are not. I’ve always focused on the physics of lifting weight rather than the physiology of lifting weight. I like to use math to measure strength. Math and physics are well-settled so there are fewer debates over that works and how much. The numbers don’t lie. The truth is almost every training method – event the really crazy and dangerous ones – do build muscle. Pro bodybuilders have demonstrated that training very frequently works. But my focus has always been efficiency. I want to know how LITTLE training will still build muscle. That makes me a lonely guy in a gym full of people who LOVE to train and would like to be in a gym 10 hours a day if they could arrange it. Trainers, exercise physiologists and gym owners all love exercise and encourage people to do the maximum. I like looking at the minimum. In a perfect world I would never do a wasted exercise never mind a wasted workout. Every time I do a lat pulldown I want to build stronger lats than I have so next time I can use a heavier weight. That’s maximum efficiency. Never the same workout twice in a the same lifetime. Never the same weight and reps on an exercise in the same lifetime. Young people very rarely care about all of this. My demographic is older men and women who now care about wear and tear on their body and want maximum benefit for minimum investment. Avid bodybuilders rarely like my training because exercise is their hobby and they want more of it, not less. I understand that and I don’t make judgements about personal preferences. So yes, you can workout 5 times a week, but why would you if you could build the same muscle working out twice a month? The answer always comes down to a love of exercise vs a desire for efficiency. Im a young guy and also went to school for exercises physiology and training was my hobby. I just cant do that training anymore when I know how much better this style works. This isn’t just for older people this is for anyone (including teens or young men and women) who want to build muscle in the most efficient way… I want to ask you though. I was making great gains once every week, then once every 9 days then 12 days then 2 weeks and my lat pull down stalled at 2 weeks. Now I’m on 19 days between and I plateaud on 3 exercises. Is more rest what I need , or should I go back to once every 12 days? Ive been training like this since November 2013. This is the first plateau since the begging of november. Now thats a pretty good training system. Also I think arnold would of got better muscle gains if he trained this style because he was probably overtrained alot of the time. Again how could he build muscle if his muscles were still recovering. Steroids doesnt help the liver and glucose systems etc..
How do you build muscle five times a week? You don’t. You can work out five times a week but it doesn’t mean every workout is productive. When you measure intensity mathematically you discover that. I think that’s why so many bodybuilders resort to the needle. Those drugs speed recovery. They can also lead to premature death. To answer your question, in 99% of cases when your progress stalls it’s because you need more time to recover. I work with people who train once every eight weeks and see an increase in their numbers on every exercise. Arnold is Arnold. Train any way you want and you’ll never get to his level. It’s the same as trying to train exactly like Usain Bolt so you’ll run as fast as he does. Ain’t gonna happen. Could Arnold have trained more efficiently? I’m sure he could have, but I don’t see how any method of training could have improved his results. Crazy, stupid, fanatical training often works in the end. My only argument is that it’s very, very inefficient and not suited to the 99.8% of us who enjoy doing things outside of a gym. Yes, just to be clear, I know a lot of people who perform 5 exercises (A-workout) then wait eight weeks to perform 5 completely different exercises (B-workout) then wait eight weeks again to repeat the first 5 exercises. When they do that they see increases on all of their numbers. It wouldn’t surprise me to see people go longer but I’ve seen that eight-week frequency corroborated many times by many different people. Your mileage may vary, but the general lesson is that it takes a long time for muscle to atrophy and there is no danger of losing muscle very quickly. Most of our studies can’t be done with bodyweight because progressive overload is critical. You can never increase the weight/minute and only the duration. Eventually your workouts have to be an hour or more long in order to be progressive. There is just no substitute for really, really heavy weights. They work wonders at building new muscle. Pete, first time poster here. I’m curious on your thoughts on levers as a means of increasing resistance. When you say bodyweight training has no way to increase the weight, you are correct. But it is not true that you cannot increase the resistance by making the lever longer (more disadvantageous lever), or by working unilaterally, e.g one arm pushups, pullups or pistol squats. The implication with weight training is that certain joint angle result in the longest lever, thereby increasing resistance, (not weight). The increased resistance, regardless of weight will stress the muscle more. Given this, my question to you regarding people who max out the weights at their gym, why not just use the same weight that one has maxed out the machine, but use it in a position of longest lever, e.g knees at 90 degrees on a leg press. Wouldn’t this increase in resistance due to lever disadvantage be adequate? 1. Extending range into disadvantageous positions is a great way to get an injury. 2. Why not just use heavy weights? They work best. To point number 1., i’m not suggesting using your max weight and moving through a full ROM with it, which would indeed invite injury. Take leg press as an example. Rather than setting the pins so that when you lift the weight off your legs are at say, a 20 degree angle, set the pins so you’ve got a 25 degree angle after lift off. The extra 5 degrees will impose a much greater demand on the muscles, but is not bordering on dangerous portions of the ROM. If it was truly dangerous, your Golgi tendon organ would sense the magnitude of force at that joint angle and shut down contraction. Progression could then be made by slightly increasing joint angle each workout. 2. “Why not just use heavy weights?” the proposed scenario was that the lifter has maxed out the weights. From my observations here, this is maybe the biggest problem with SCT – I’m not just throwing out wild “what if” situations. Certain exercised lend themselves to working unilaterally like leg press or pulldowns, but others not so much, like bench press. In the event you cannot work unilaterally, cannot increase weight, is increasing the lever a viable way to progress? quick correction, i got my angles wrong. in the example given, i meant you’d go from 160 degree angle to 155 degrees. One study showed that performing 4 sets with squats compared to 1 set produced greater strength gains. And further, performing 8 sets of squats compared to 4 sets produced even greater strength gains. This study was done with two groups squatting twice a week. I have experienced myself that squatting three times a week produces better strength gains than once a week and for a period of 3 weeks i squatted 5 times a week and i set a new PR 440lbs squat weighing 163 lbs. Many people have experienced, at least for squats, that higher training frequency produce greater strength gains in this exercise. Would you say that static contraction training once a week would produce greater strength gains than performing full range of motion squats 3 – 5 times a week ? Squats build muscle. Full-range reps build muscle. Multiple sets builds muscle. No question about any of those. All proven billions of times over centuries. What I’ve always said about Static Contraction is it is the most EFFICIENT way to build strength, mass and size. It uses one, single 5-second maximum exertion with the absolute heaviest weight you can lift under the safest, strongest conditions. Using that alone, a person can add 10, 20, 30+ lbs of muscle mass. So…you can do 20 times that effort on each exercise (multiple reps and sets) but you won’t get 20 times more strength, mass and size. Static Contraction is about minimum-dose efficiency and absolute minimum wear and tear on the body. But I’ve never said it builds MORE muscle than any other method possible. It just builds it 20 to 50 times more efficiently. I play tennis and soccer and I need to have a very good physical condition to play at a very competitive level every weekend. So I have to do cardio 30-45 minutes per day, sometimes is the elliptical machine, the stationary bike, the treadmill or a rowing machine, some days I do high intensity intervals, other days I just do it at a steady pace and I just try to make variations so it won´t get boring. I also do a 45 minutes weight lifting work out program, usually I work out a muscle per day (Monday-Legs, Tuesday-Back and Chest, Wednesday-Shoulder-Forearms, Thursday-Biceps and Triceps and Fridays-Abs and Stretching) and as you have stated most of my workouts look the same, 4 or 5 exercises per muscle with 4 series of 12 to 15 reps each, so unless I feel with a lot of energy I usually use the same weights and do the same exercises for every muscle. Of course it gets boring and mentally tired because I use 5 days per week for no less than 90 minutes. I can tell I have a good physical condition so I can play a full soccer match performing pretty good and I rarely get injured, but I would love to find a way to be more efficient with my workouts so I can get stronger and maintain my physical condition so I can keep playing at a very high level every weekend. I don´t use any kind of supplements, but I can say that I eat healthy. Any suggestions I can use or a program I can get and change the way I train? It’s sounds like you really love to exercise often. If you could achieve the same end results, would you even WANT to exercise for just a few minutes per week? Would you be happy not doing 90% of what you do now? Thanks for your answer Pete, of course I would love to have more efficient work outs, I´m 40 years old and I have had 3 knee surgeries, so I must have strong legs and watch my weight to help my knees. Since I love to play tennis and soccer, the exercise for me is not an option, it is mandatory, but it demands a lot of discipline from me that sometimes is hard to keep up. Due to my work I travel often and I have to carry my gym shoes and cloth.I´ll be more than happy for not doing 90% of what I do today, so is it possible to get better results with any of your training methods? Would I be able to maintain my physical condition and have enough endurance for a full soccer match? I´m willing to give it a shot! It sounds like you’re taking the maximum dosage of every exercise. It’s a good bet that you could significantly reduce the dosage and get the same results. But Step 1 is that you have to objectively quantify the volume and intensity of every weightlifting exercise you perform on every workout. 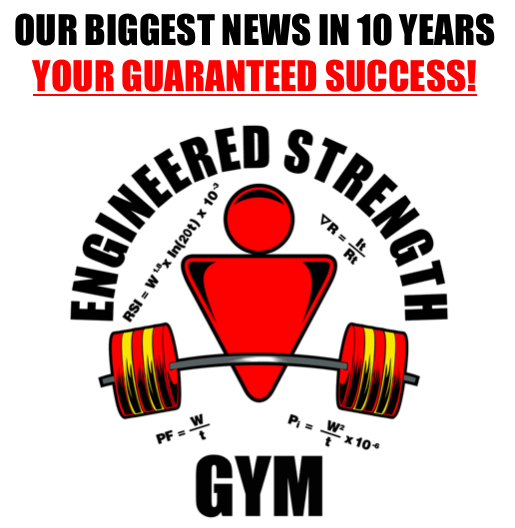 Only then can you engineer exact power output goals that either maintain or improve your strength/power. It requires knowing the exact numbers for weight, reps, and seconds taken to complete each exercise. Without those numbers, everything is just conjecture and talk.